Of the real thoughts and feelings of the criminal, of the terrible fascination which binds him to his nefarious career, of the thousands — yea, tens of thousands — of undiscovered crimes and unpunished criminals, you know but little. Always nice to have a twisty, light episode where somebody has to read a Nazi textbook, isn’t it? At heart, though, this is an episode designed to reassure us about Joan and Sherlock’s partnership. Wherever they stand right now, the Shinwell Issue doesn’t reach them. As far as they know right now, Marcus’ case is resolved. They’re squarely in a space of domestic squabbles (if you’re going to practice bullet-catching in the house, call ahead of time so nobody gets a scare! 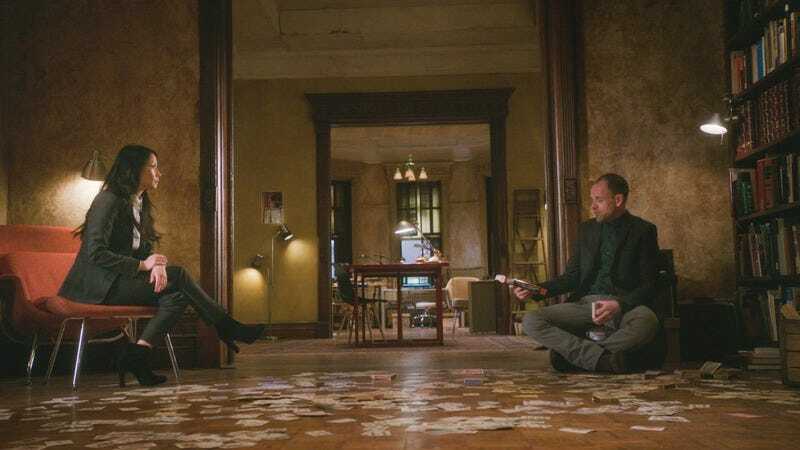 ), parallel sleuthing (backwards cards and Carpal tunnel scars), and the sort of offscreen conversations that, when properly deployed, make them look psychic. Yet it’s hard to shake the feeling that Joan and Sherlock are going to be in trouble; something about an episode titled “Sleights and Deception” just doesn’t put you in a very trusting mood, I guess. It’s not hard to imagine that Marcus’s subplot about Internal Affairs, Roy, and Chantal is going to escalate and go poorly enough to shake Joan and Sherlock’s rock-steady understanding. There’s a lot at work in Marcus’ subplot. First and foremost is Chantal herself. I assume she isn’t dead, because the show’s generally more thoughtful than that, but she hasn’t appeared enough to really develop as a character, which means whatever’s happened to her is meant to function as motivation for Marcus, so it’s not that thoughtful. There’s also Marcus’ antipathy toward Internal Affairs (somehow in the same episode where he threatens to expose a crooked cop!). Marcus is, of course, innocent. The episode doesn’t leave us in any suspense on that score; Joan manages to shake down the false witness in between all the Nazi stuff, it’s that clear. But in a cultural moment where plenty of cops are pulling guns and Internal Affairs isn’t nearly as interested in that as they should be, giving Marcus this particular problem without specifying why he’s an “opportunity” feels like a weird move. (If he’s angry because he’s easy to make an example of while white cops get away with the same thing, I’d love to have the show tackle that. I just don’t expect that it will.) As it is, his and Joan’s first instinct is to call the DA’s office and see what they can do about potential criminal charges, which…just sounds like another red flag for Internal Affairs, honestly. Marcus knows better; Joan, interestingly, doesn’t seem to much care. Morally-gray Joan comes and goes from the show, and her zeal to protect Marcus is questionably deployed in this particular case. (Meet With A DA To Openly Stare At A Witness In Broad Daylight: The “I Promise To Tread Lightly” Story.) But it’s interesting to watch, if only because her quiet assurance never wavers. When she’s well on the side of the law, she has no doubt of her course; neither does she doubt herself when she’s skirting legalities. It’s honestly one of the reasons I’m always wishing we had more glimpses into her psychology. When Sherlock is about to cross a moral line, we know if he’s conflicted; if he isn’t, we know why he’s righteously dismissive. With Joan, it’s hard to tell, and by now, it shouldn’t be. We do know that whenever Joan dips a toe in that moral gray area, Sherlock can usually be counted on to disapprove. We also know that, in the past, Sherlock and Joan’s mutual harmony gets this much weight right before something tries to break it. What we don’t know is what happens now that Marcus is the one caught in the middle. If you haven’t Googled “Judas cradle,” definitely don’t. Incredible set dressing on Claude Rysher’s apartment. You could have set the entire investigation in there and it would have been fine by me. “I’ll understand if you want to see other detectives.” Marcus clearly likes Joan. He fondly puts up with Sherlock, but sometimes juuust barely. See also: The melon, which is an incredibly embarrassing moment that Joan has to deal with for some reason, but it also one of the best time-crunch workarounds this show’s ever managed. That researcher is the sort of witness I would love to see more often; her testimony manages to tell a story amid the exposition, and we get a glimpse of who she is as a person—I like any time someone on the other side of the interrogation table has a personality. Okay, let’s be honest: Is “plainclothes” still considered ‘cop talk’? 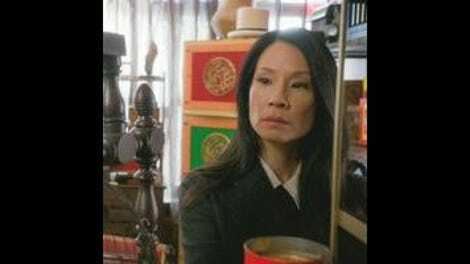 Does Elementary take place in a universe where witnesses routinely suggest checking their bank accounts and security footage to clear their alibis, but somehow no one knows the term “plainclothes”? Is this like when the SVU detectives went to a rave and were shocked that their cover got blown? That cab driver got an earful about the $$$ history of a prestidigitation tell-all in connection with an open murder case, didn’t they?